Voila! 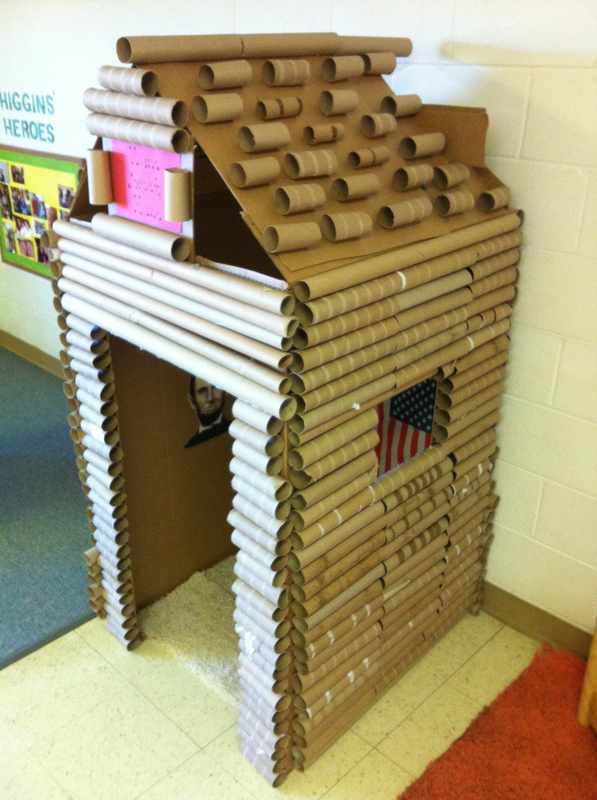 Paper Towel Log Cabin! 1. Find a big appliance box — pictured is a box for a smallish refrigerator. If you don’t have any on hand you can procure one by calling your local appliance stores. It really depends on the size you want to end up with – the bigger the box the bigger the cabin, but on the other hand the more paper towel tubes or gift wrapping tubes you’ll need. 2. Carve out with a blade (be careful!!) the windows and door. Position top flaps of box to make the triangular roof – if not perfectly even use butcher paper (or brown paper bags) to make up for any gaps on the ‘peak’ of the roof. We used clear packing tape to hold things together. TIP – to save time – measure windows by placing a paper towel tube on both sides to gauge how wide the window needs to be – this will save you from having to re-carve the tubes later to accommodate extra space. 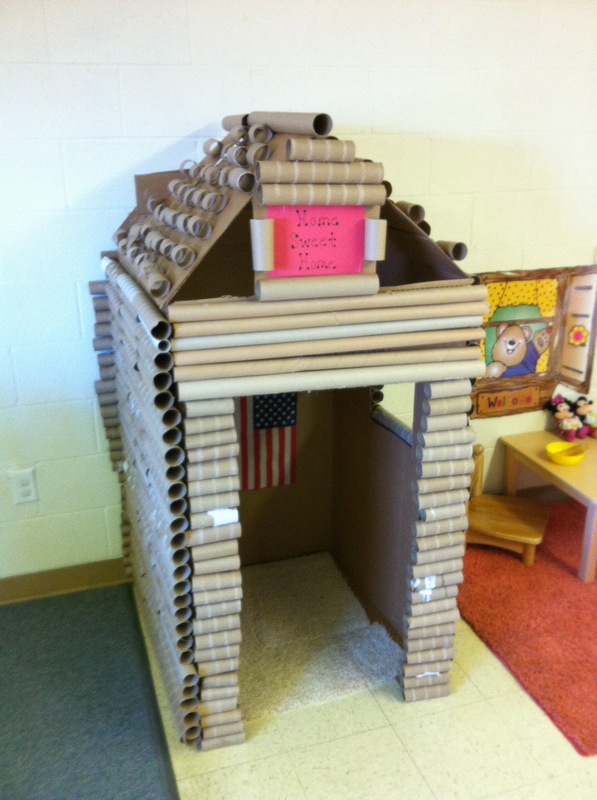 Now… if you DON’t have enough tubes to fill everything up – I would use brown construction paper (even better if they were on their way to the recycling bin anyways) or any color construction paper (if you’re adventurous 🙂 ) and roll them up to the size of the paper towel tubes – just tape the ends and glue to the cabin. No need to fill the backside of the cabin if the cabin will be backed up to a wall anyway. This is fantastic! I absolutely LOVE this and am going to start collecting the tubes now!